that you gave to your mom? I said "I love you MOMMY!" My Mother’s Day memories with my children were not presents as I know they could not afford to buy any but usual “Happy Mother’s Day, mummy!” a simple wish to make an old hag happy. However, this year Mother’s Day would be my favorite and a blissful memory because my little boy made a handmade craft that he had completed in pre-school for Mother’s Day gift. 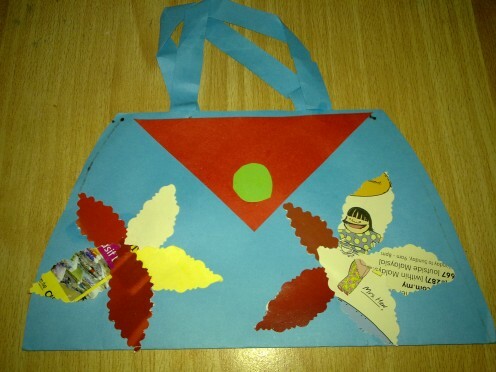 I was really surprised when my little boy pulled out a handmade blue Mother's Day paper handbag made from recycles materials which were simple, easy to make, unique from other gifts that I had saw in some websites. Actually, paper handbag is a suitable gift for any woman for any occasion; Mother’s Day, Valentine’s Day, Birthdays and Teacher’s Day. 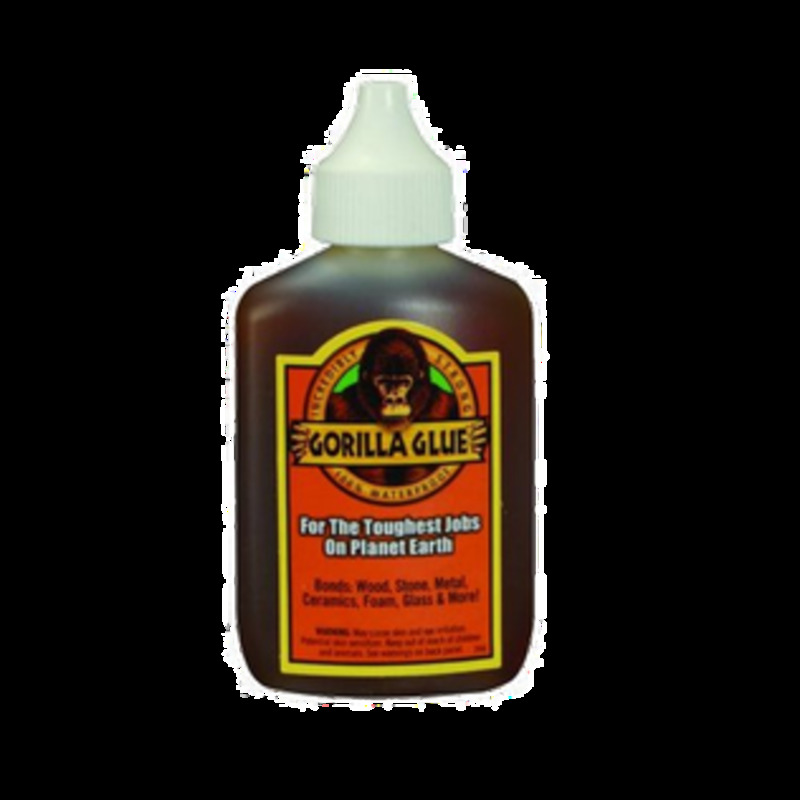 why you should buy a bottle of white glue instead of a normal school glue. 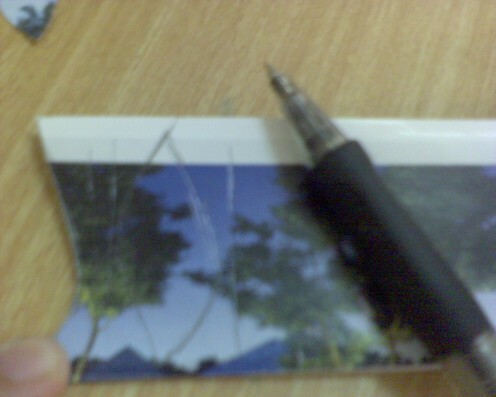 Normal school glue doesn't stick thick papers such as brochures or cardboard permanently. It comes off easily once the glue dries off. My son was angry at the glue. so I bought white glue that gives firm and permanent seal which are ideal for craft making. White glue may cost a little more but worth it. A little white is all it takes to seal firmly. 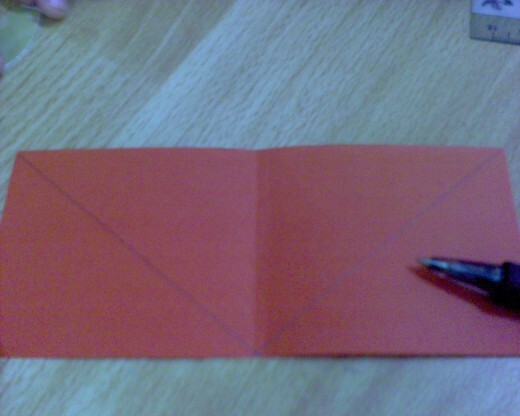 Fold an A4 orange paper into half. Turn the creased side of the paper downwards so that when you flip open the paper, it will look similar to opening up a handbag. Otherwise, the handbag will turn out 2 separate pieces. 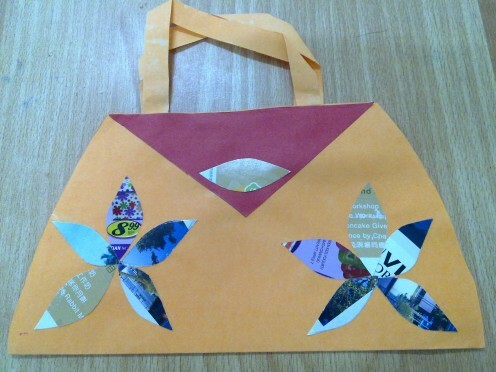 Have you ever made paper handbag or purse in art class? Leave approximately 1 inch space from the top. Draw the handbag body shape with 2 wide curves, one on the left hand side and another on the right hand side of the paper. Next, draw a straight line across from the left curve starting point to the right starting point. That will be the handbag closure flap. 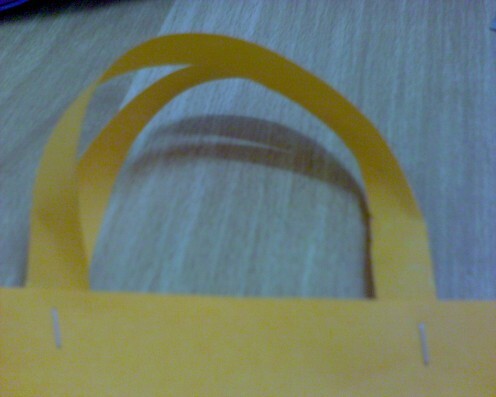 Use a pair of scissors to cut along the shape of the handbag. Do not discard the left over papers. Leave aside for later use. Try flip open the paper handbag. It will look similar to a big greeting card. 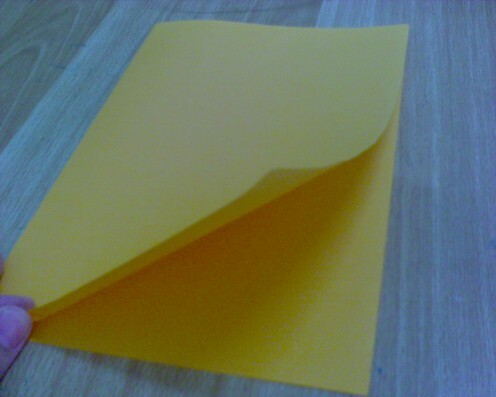 Remember the left-over piece of orange paper? Use it to make 2 pieces of handbag handles. 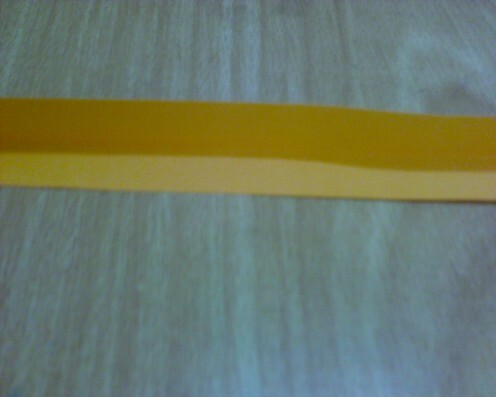 As you can see, the left-over orange paper is rectangular shape. Snip off the funny shapes. 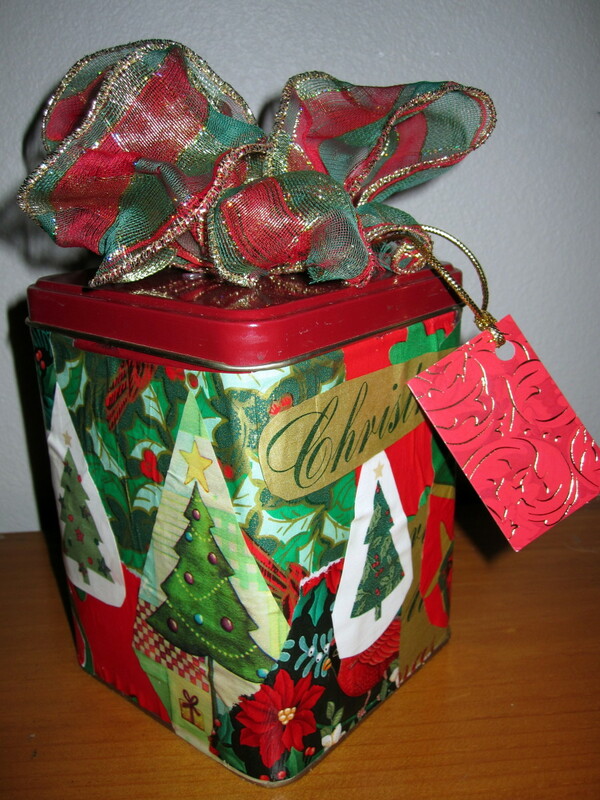 Measure the width and length of the rectangle paper approximately 2.5cm x 20cm. Fold down vertically. 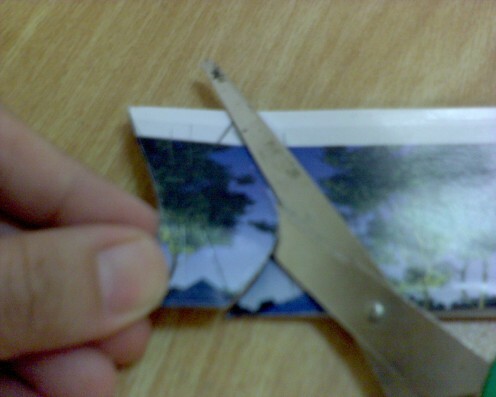 Use the scissors to cut along the creased side to produce 2 straight strips of handles. Flip open the paper handbag flat on the table. Make sure that the front and back of the handbag is facing up. Let’s start making the handbag handle from the top side. Take the end of one strip of the handle and place it inside the bag, on the left hand side. 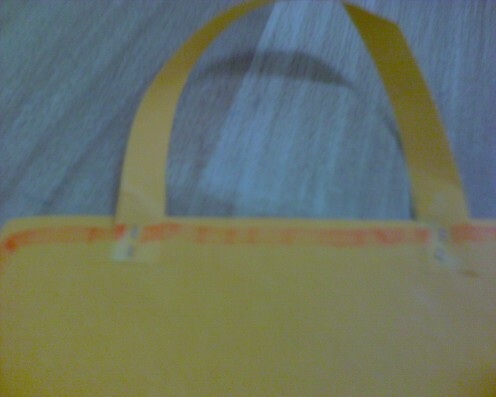 It is located near the edge of the handbag closure flap opening just as picture shown. 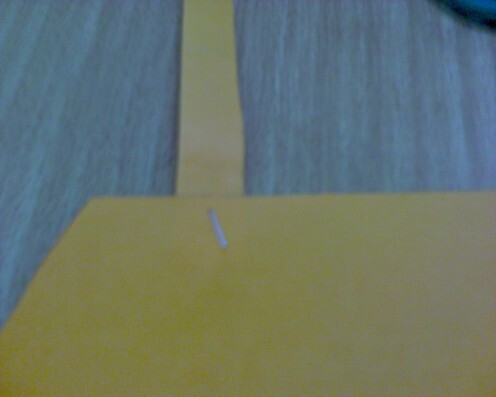 Use a stapler to punch a staple outside the handbag. 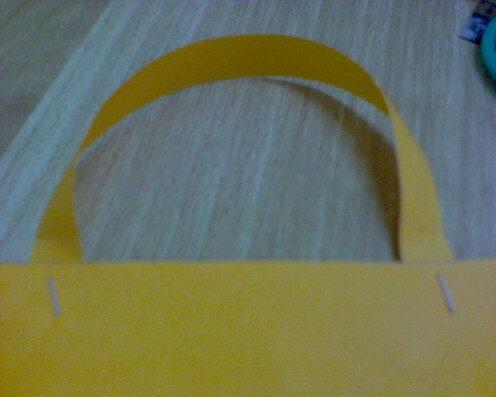 Make sure that the handle is stapled together onto the handbag closure flap. Take the other end of the strip handle. Place it inside the handbag, on the right hand side. Staple the handle onto the closure flap . Make sure both sides of the handle are inside the bag, not outside. Now, proceed the same steps for making the handle on the other side of the handbag. Your handbag handles are done! I love Sharpie Highlighters. There are rainbow colors of highlighter that Sharpie has and these colors are rich, great color contours and doesn't comes off. I am pleased that the highlighters' color contours . The colors do not stain on my hands too. Each has the retractable function just like a mechanical pencil. No need to fuss where the cap has gone too and doesn't dries out the ink. It is great for drawing borders, writing quotes in handmade cards and highlighting notes for homework. Flip open the paper handbag flat on the table again. This time, make sure that the inside handbag is facing up. 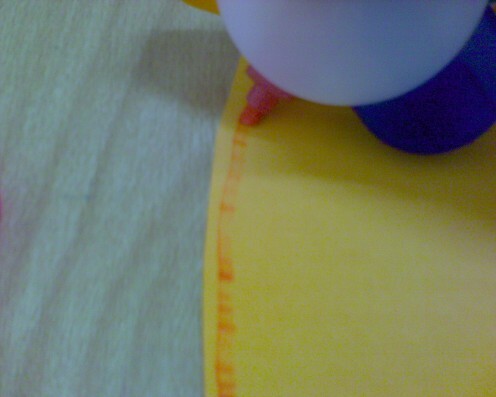 Use a color marker pen to draw the continuous line along all the four sides of the handbag borders. Try to draw the line continuously , don't get it too close to the handbag curves. Remember to draw the line across the closure flap too. You can change the marker colors on each sides if you want to make it a fancy handbag. 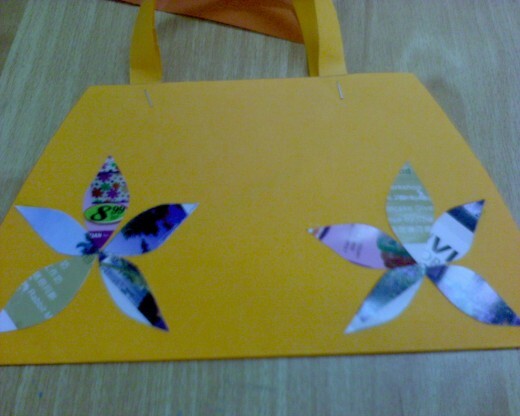 Let’s add some flowers onto the paper handbag. I chose to use a brochure since it is thicker and colorfully designed. The main reason to use thicker brochure is to make the paper flowers appear 3D designed rather than plainly paste. 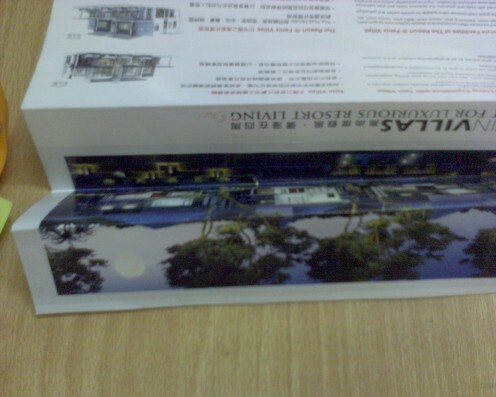 Fold down the top flap of the brochure twice, roughly the width of 3.5cm , length doesn’t matter. Use a pencil or pen to draw 6 leaves shape on the folded brochure, leaving a little space in between each other. Size of the leaves doesn’t matter, depending on how big or small you intend your flowers appear on the paper handbag. 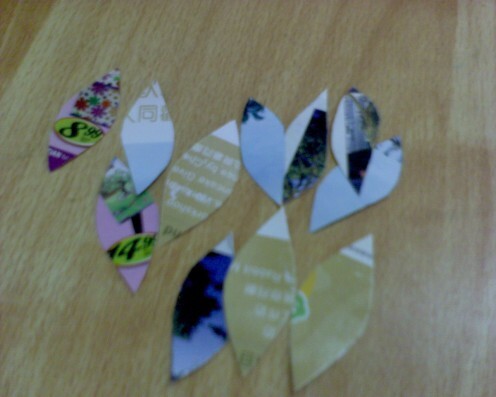 Cut out the leaves, you will need 16 pieces, 5 leaves for each flower (the leaves are the petals). Since you need to create 3 flowers, then you will need to have 15 leaves and 1 leave for the button of the closure flap of the paper handbag. Let’s decorate the back paper handbag. 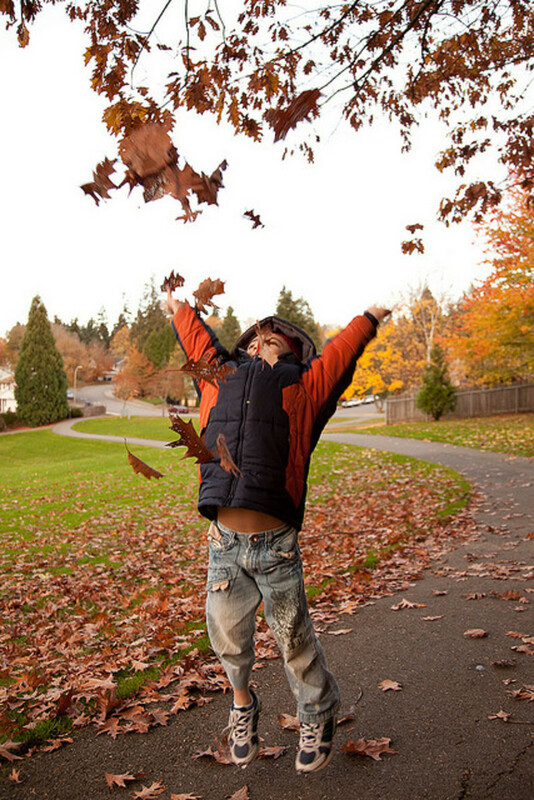 Pick out 5 pieces of leaves. Apply a little white glue on each leaves. Paste the leaves in the form of a flower at the bottom left-hand side corner. Repeat the same for the right hand side corner too. 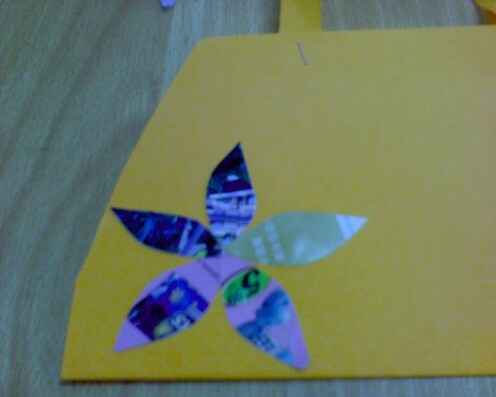 I used a red color paper to match the orange color background the paper handbag. 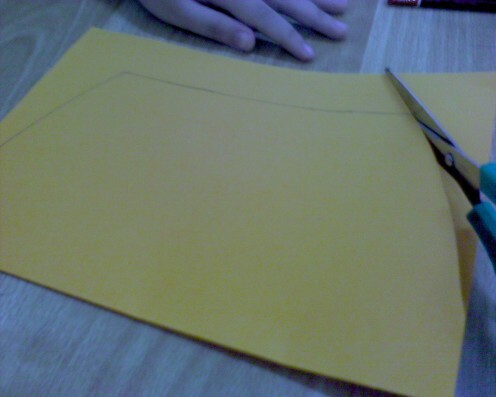 Use a ruler and pencil to draw a "V" shape that symbolize a triangle upside down. 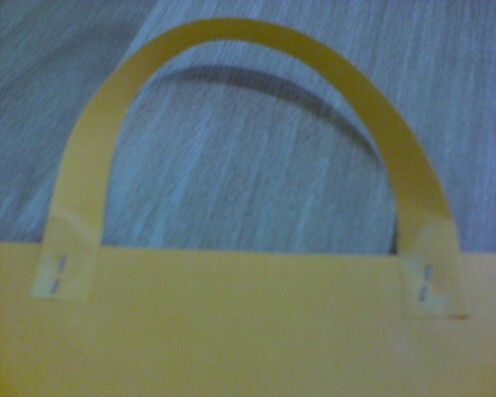 This is the handbag flap, a fake one. 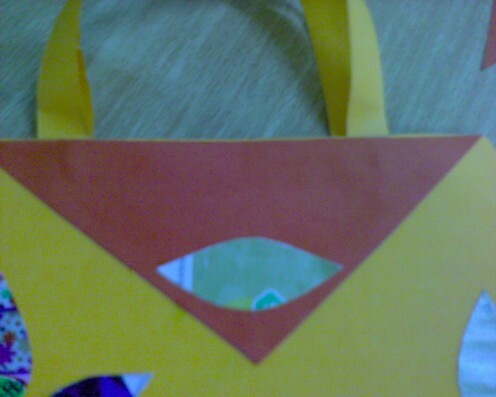 Cut out the triangle shape. 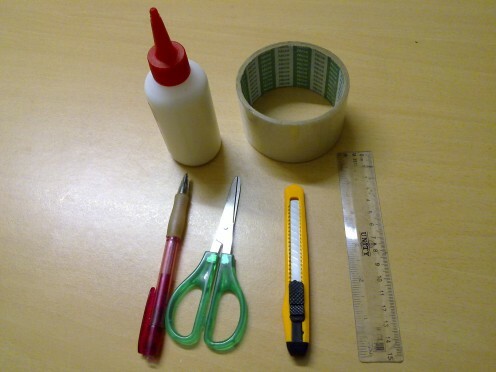 Apply some glue behind the triangle shape. Paste it at the top of the handbag, near the handles. 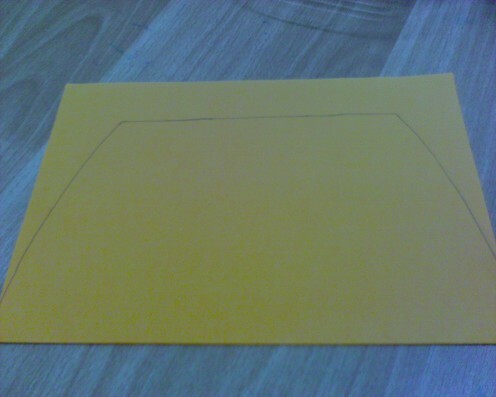 Draw a diamond or circle shape on the excess brochure. This is the button of the handbag. Apply some glue behind the button. Paste the diamond button at the end shape of the "V" as photo shown. I love you mom, BEARY MUCH! Don't FORGET to write down your name!! Lastly, write a Mother’s Day quote inside the paper handbag with color pencil or crayon and sign off with your name ! You can find some great Mother's day quote here that touches your mom's heart. Alternatively, you can print the quotes out on plain paper and paste it inside the paper handbag. 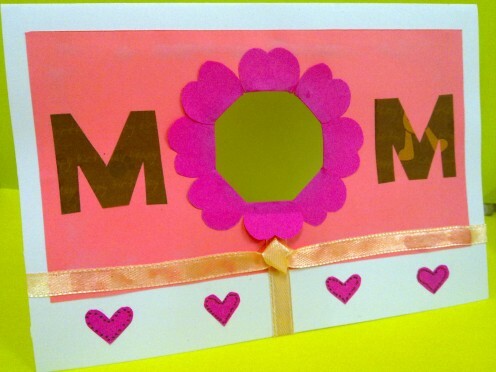 Mothe'rs Day card is not hard to do if you use just a little trick to change a simple card into a pop-up card. You don't have to give her actual flowers because this card comes with flowers too. Are you searching for easy to make Mother's Day gift ideas? In this article, I have selected 5 easy handmade Mother's Day gift ideas which are creative and easy to make gifts from recycle items. This Mother's Day, show your love to your mom with handmade Mother's Day card that is half fold, a creative homemade card idea. This homemade card for mom is easy and personally crafted. Prepare a mouthwatering breakfast with these simple to cook Breakfast In Bed recipes for your mom on Mother's Day. These homemade gifts will touch your mother's heart easily. A Happy Mother's Day ! How cute these are. It is project that would work well in stages..doing a little bit today and a little bit tomorrow. 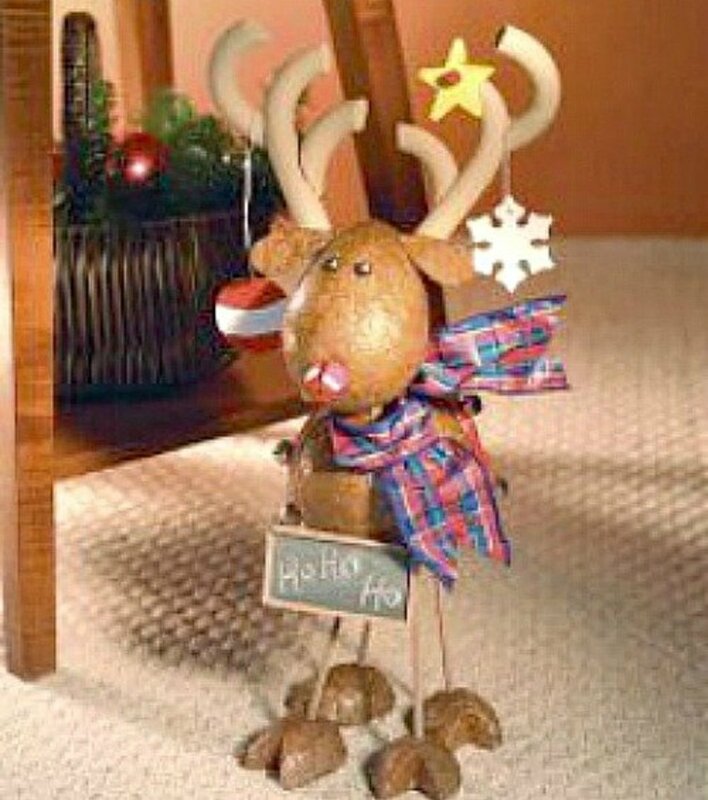 The crafting activities for special days were always a hit with kids. Thanks for sharing your method on this Mother's Day craft. thanks peggy w, yes, I was so happy that he gave it to me, still keeping it. What a really cute idea! This would be a purse a mother would treasure forever. Great creative post and I will share it with my daughter in the UK for my granddaughter to do as a project. This looks like a lovely project for children. I'm sure that many mothers would appreciate a handmade gift like this from their child. I'll bet you were really pleased when your son brought home that Mother's Day gift that he had made at school and presented it to you. Those times make for cherished memories! 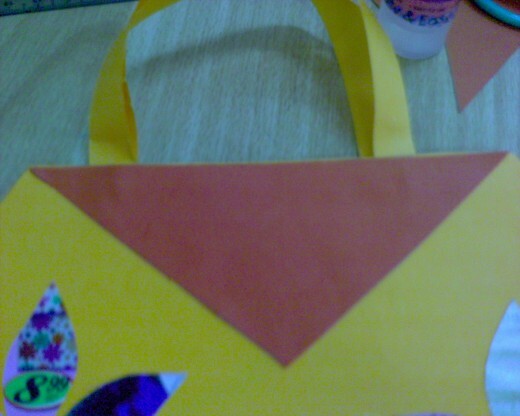 The paper handbag that he made for you is very pretty! Thanks thelme, drawing future house is cool. Was it a bangalow? What a great handmade gift for mother. Practical and with good instructions. Voted Up! Very good idea for Mother's Day. Wow! This is very creative. 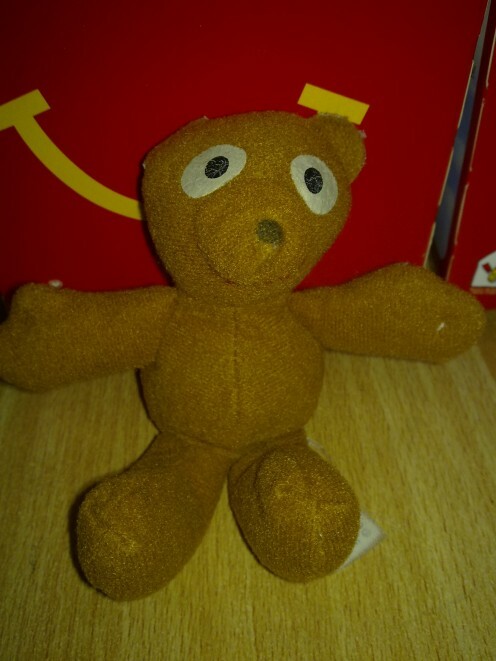 It reminded me of a mother´s day gift from my son when he was in elementary grade. Though it was not a paper hand bag but a drawing of my own future house in the Philippines. Voted up and useful. 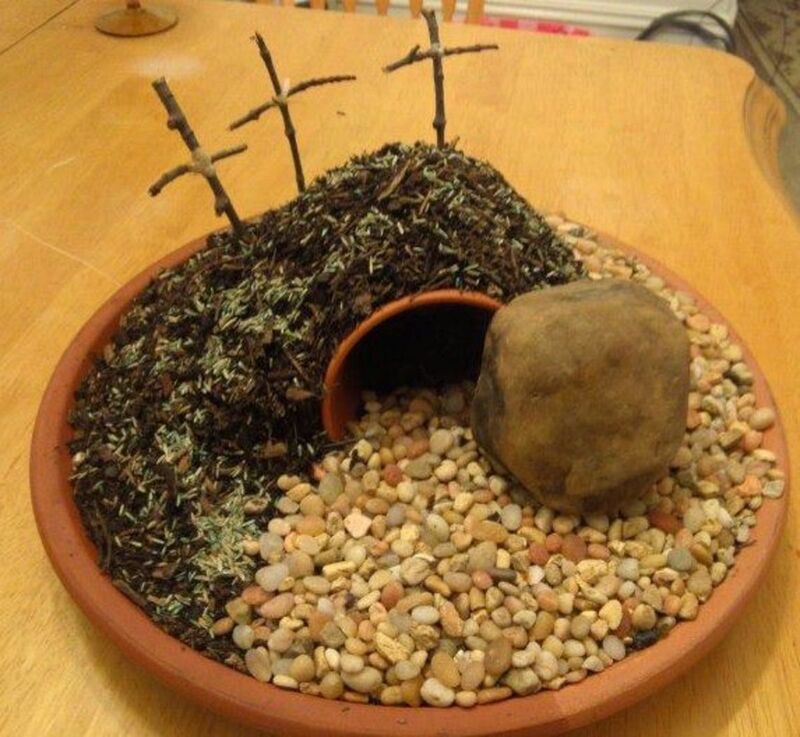 This is a great, simple project for kids to make for Mother's Day. Love it and voted awesome!